Nz107 BSM U Schleuset, K.V.U. Gruppe St-Nazaire'C2', K.V.Gruppe Loire. 1 x 6 Schartentürm (40P8). 1 a 4.7cm Pak K.36. R631 without a flanking wall for a 4.7cm Pak K.36(t). Air picture Nz107 BSM U Schleuset. 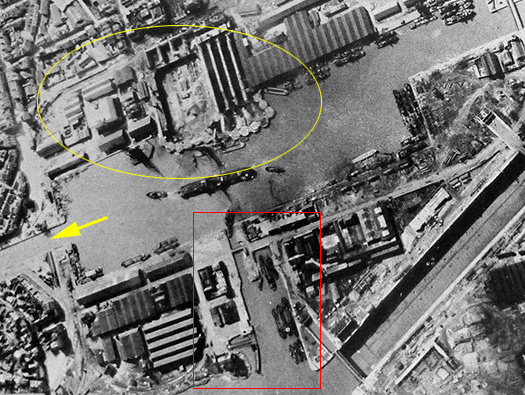 Yellow circle this is an air photo of the early U-Boat pens when building had just started. There was no need for a heavy concreted U Schleuset (U-Boat Lock) as the boats can enter via the large left hand lock (yellow arrow). Also there is very little bomb damage as RAF bombers from 1940 to 1942 had a job bombing a large town let alone a small lock entrance. 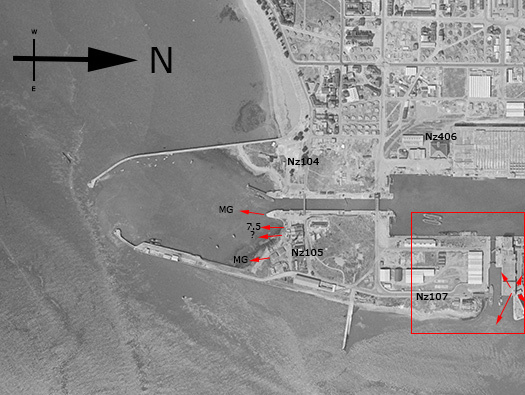 The red square is the site of a smaller lock which was where the U Schleuset was eventually built. Bombing became more accurate and also the bombers started to get bigger with heavier bomb loads, so something had to be done to keep the boats safe when entering the lock. 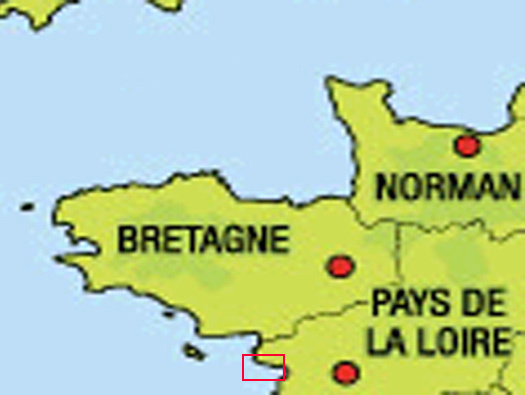 Main Ecluse (lock yellow arrow) where U-Boats would enter the basin. U-Boat entering St-Nazaire through the lock were very vulnerable to aerial bombing here. Dönitz in 1935 the head of the U-Boat service. NA Interpretation Report N°. A.S.50..
An interpretation by the RAF staff at RAF Medmenham of what the German Navy was up to at the time. This was after the attack on the Normandy Dock (Dry Dock on plan) and the replacement of the sliding caisson was also being replaced by a large concrete building to protect it from an allied attack. Caisson building for the Normandy Dock. Red - Caisson building (now removed). Blue - The line of the Normandy Bassin. Black - where the site of the lock gate. Operation Chariot the Combined Operations attack on the Normandy Dock 28 March 1942..
HMS Cambeltown smashed into the Normandy Dock. Coffer dam used around the U-Boat pen. The first thing when working with water is to stop it getting into a hole, you need to dig to build a large U Schleuset. First make a coffer dam. Coffer dams here were steel sheets that link together and thumped into the ground in a circular shape then filled with earth gradually hold back the water and then you can dig your hole behind them and make the foundations for your U Schleuset. The U Schleuset built and the coffer dam removed, boats can now sail in at any tidal state. 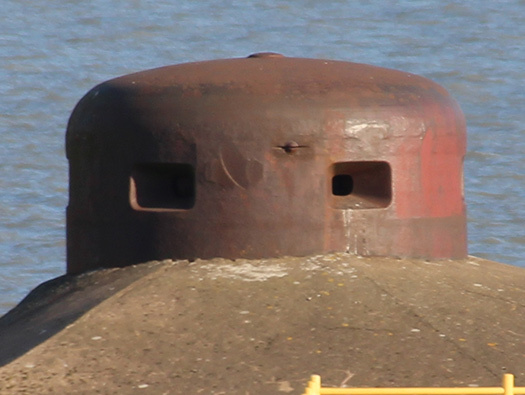 Get into the lock and the level brought up to the basin and the U-Boat sail out into the safety of a pen. These were never finished in time by the end of the war. here a 1952 picture after the war had ended and clearing up had started, the lock was not finished by 1945 the same as the one at Royan and possibly Bordeaux. The St-Nazaire council looks as though it has cleared out the small lock and tidied up the remains of the coffer dam. Twin engined Whitley bomber one of the early pre war bombers. Slow, very little armament and a small bomb load. Next the Wellington, better armament, a larger bomb load but still only two engined but a step change from the Whitley. The Short Stirling, now we are getting there, larger more powerful and better armed and probably double the bomb load to a Wellington. Handley Page Halifax a modern four engined bomber capable of carrying a good bomb load..
Then we come to the Lancaster the last generation of heavy bombers. They carried radar H2s and better bomb sights. The largest bomb loads. U Schleuset really a long box or square tube with lock gates front and rear allowing submarines access with safety from bombing. Rising up to the level of the basin. First the Americans came with the Liberators. Then the B17 came, not a big bomb load BUT there were plenty of them and they came and came again..
View from one of the U-Boat pens. Flak towers on the roof and the machine gun turret. Armoured ball joint machine gun fitting. Turret. 6 Schartentürm (40P8). 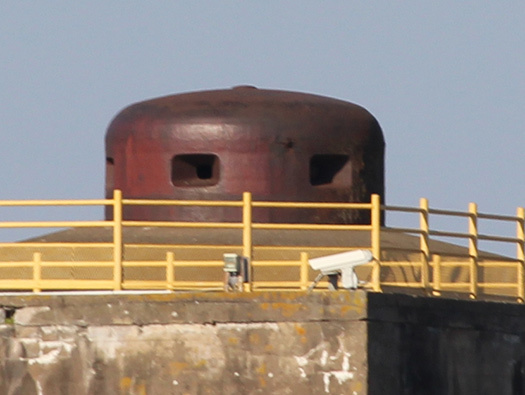 In the centre was a periscope for the bunkers commander to look for targets and help the gunner to shoot. The sea entrance of the U Schleuset. The concrete supports on this side were for the Loire car ferry now also redundant like the bunker. The sea entrance of the U Schleuset. The mesh is to try and keep out the Pigeons. Front end of the The sea entrance of the U Schleuset. The original French small Lock, I believe it was/is called the fishing boat lock..
Set of steel ladders running up the side of the bunker. The modern control room to control the fishing boat lock gates. The smaller French fishing lock gate looking at the massive U-Boat pen. The smaller French fishing lock gate looking back out to sea. Defensive machine gun embrasures covering the roadway. Defensive machine gun embrasures covering the roadway. 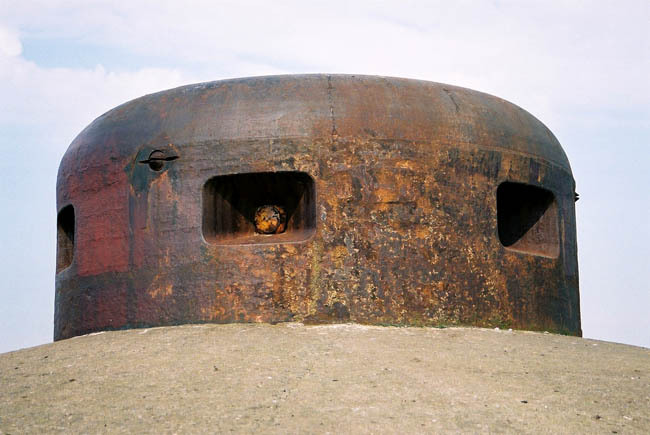 The wood was used to form the shape of the embrasure and left in place to help with ricocheting bullets. The iron door to close off the roadway in the event of bombing. The iron door to close off the roadway. This I think is the original bridge that would lift up into the roof and then lowered down when not needed. How I presume the bridge worked. The view towards the U-Boat pens. U-Boat pens with the flak position on the roof. 2cm Flak 28. Tie down to hold the U-Boat in place when the water level changes. How to tie up a boat. Looking back through the road way with the original bridge in the roof. An entrance up to the roof and now a night club/cafè I believe, it was being restyled inside so we could not enter. The turret on the roof. 6 Schartentürm (40P8).